» Hellraiser Lights! Camera! Vegan! I don’t have anything witty to start this post off with, because have you met Pinhead? Dude is serious as hell! Cenobites don’t have a sense of humor, they don’t make jokes while they’re filling your face with hooks. 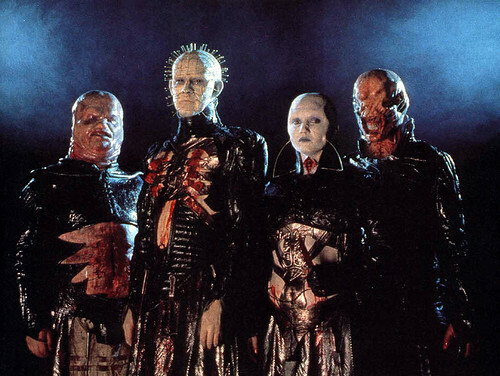 Hellraiser is all about a puzzle box, that when opened, summons demon-like creatures (cenobites) who will torture the lucky prize winner and take their soul to hell. There is lots of leather, hooks, and blood involved. A lot of sticky, icky, blood, and a lot of gross-but-cool stop-motion animation. If the idea of watching a skinless man talk for a good chunk of the movie makes you feel ill, you might want to sit this one out. But it really is a solid movie, good acting, good writing, never a dull moment. The second movie is just as good as the first one, and picks up immediately where it left off. There isn’t too much that can be said about it without spoiling the end of the first movie, but we’re shown what hell looks like (it’s a giant, dreary maze), Pinhead is given a little history, and there’s a new cenobite (Dr. Penishead, we’ll call him). And then the series starts to go downhill. If you want an in-depth (but spoilery) look at the series, I watched this review not too long ago and agree that the third movie can be skipped but it won’t hurt to watch once, Bloodlines is pretty cool, and then faaaaaaaaaaaaaaaaaaart. I will say that I had trouble thinking of a menu for this one, so Brian and I rewatched it and I said, “If you see anything that makes you think of food, let me know.” His helpful suggestions were ‘what about the rats’ and ‘that giant fetusey worm thing’. I mostly went, “Oh god, what was I thinking, this is too gross for food!” But at the last minute I thought of three things, so here you go! P.S. I promise this is the grossest movie I am doing, there will be no Saw menu. Entree: Franks in a Larry, aka pigs in a blanket. You can wrap your favorite veggie dog in puff pastry or Pillsbury dough (kind of gross, but vegan! ), or make baked corndogs. To make them extra icky, brush the franks with bbq sauce before wrapping them. Side: Cube your veggies when you make these roasted beets and carrots, and you’re good to go. Dessert: Are you ready to chuckle/groan at me? Okay, here we go: CINNA-BITES. LOLOLOLOLOL! But yeah, we’re just going to make monkey bread and call them that and admire my cleverness.